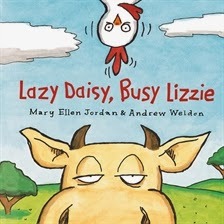 Lazy Daisy, Busy Lizzie is a fun children’s picture book by Mary Ellen Jordan and Andrew Weldon, published by Allen and Unwin, 2013. RRP is $Au12.99 for the soft cover version. It's also available as an ebook. This is my cow, she's called Daisy. She should eat grass but she's too lazy. Instead she eats jelly, spoon after spoon, all through the morning till late afternoon. Look, look, LOOK! From a cow eating jelly, to a toe-tapping chook. What else will you find when you open this book? I must admit, Jordan had me with a dancing chook in purple underwear. But I loved the other animals too, and Jordan's jaunty rhymes. Weldon helps bring them to life, adding even more characters for kids to discuss - roller-skating sheep would, of course, wear a top hat! The final spread of sleeping animals in the barn makes a feel-good end to this simple rhyming story. There are two cute downloadable colour-in sheets at the Allen and Unwin website. Find more Children's Book Reviews on The Book Chook by clicking Reviews in the right sidebar. If you've enjoyed this post, or any others at The Book Chook, I'd love you to help me spread my literacy, learning and literature ideas by promoting via Twitter, Pinterest, Facebook, StumbleUpon, G+ or any other way you decide.